Description: The Harvest Sun Wreath, made with autumn colors, will be a welcome addition to your holiday decorations. 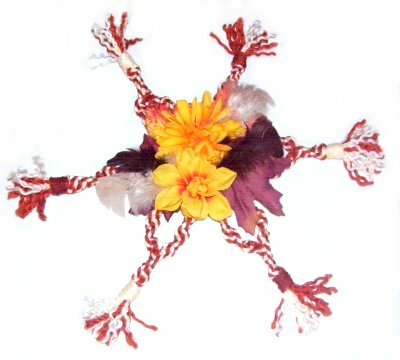 Many people put floral wreaths on their walls during fall and winter. So the best colors for this Macrame project are earth tones, such a brown, rust and gold. The circle in the center represents the sun, and two colors resemble the sun's rays. Dried or silk flowers are symbolic of the autumn harvest. You can add dried corn, real flowers, pine cones, feathers and dried grass, if you want to make a completely natural wreath. In the example shown, I used nylon material, but Hemp and Jute look great, too. Step 1: Cut one cord, 72 inches long. Apply tape to the tips to prevent unraveling while you work. 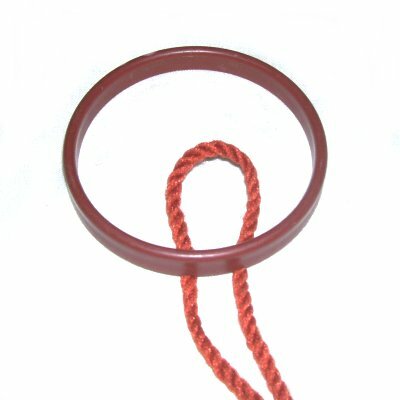 << Fold the cord in half, and place it under the bottom of the ring. Pull firmly on both ends to tighten. 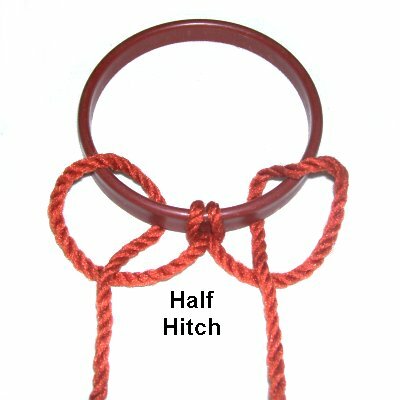 Use each end to tie a Half Hitch, which will rest on either side of the Larks Head knots. Step 2: Repeat step 1, mounting more cords, until the entire ring is covered. 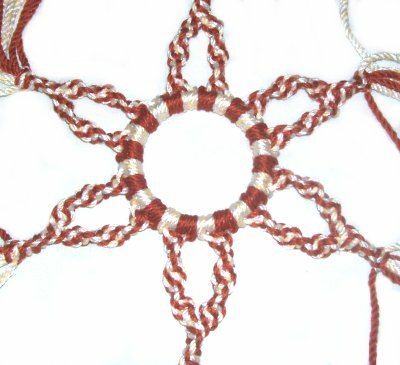 The main area of the Harvest Sun Wreath is made with the Spiral Stitch. It's here that you can make changes, if you want to try other knots. Step 3: Each chain of knots is made with 2 working cords and 2 fillers. Tie several knots, until the sennit measures 2 inches. 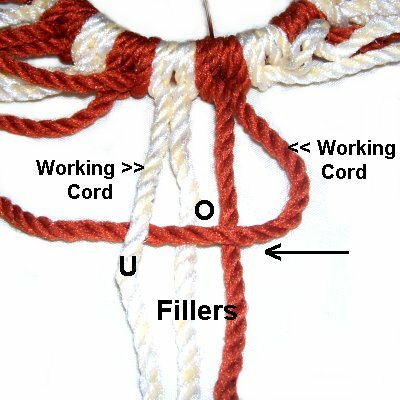 << Move the right working cord to the left, passing over the fillers and under the left working cord. Design Tip: As you tie the knots in the Harvest Sun Wreath, twisting will occur by the time you tie 4 or 5 knots. At that point, rotate the sennit half a turn. In other words, the left working cord moves to the right when you rotate. Step 3: Repeat step 2, all the way around the ring, using groups of 4 cords. Design Tip: You could stop here, and skip to the finishing steps if you want just a small sun decoration. For a wreath, continue on to the next steps. Step 4: Bring two sennits close to each other. Organize the cords so there are two working cords and 6 fillers. 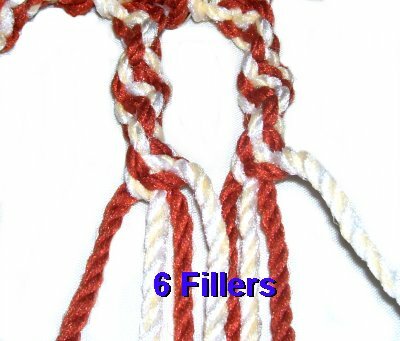 Tie a Spiral Stitch sennit measuring 1.5 inches. The design will not twist on it's own, so you will need to rotate it. Step 5: Repeat step 4 with the other groups. For the finishing touches to the Harvest Sun Wreath, you will tie Wrapped knots around each group of cords. The instructions are below. 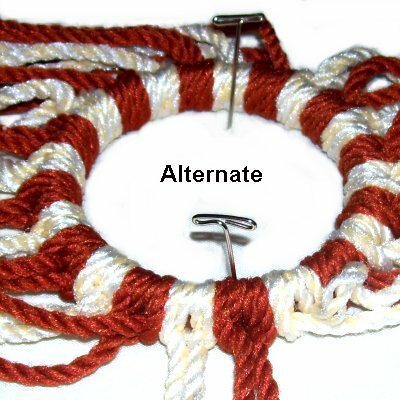 Step 6: Arrange the wreath on your left, so the ends coming from one spiral design are horizontal, heading right. Cut one cord 12 inches long. 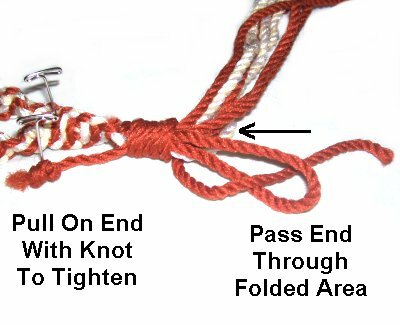 Tie an Overhand knot at one end. Step A: Secure the knot just below the spiral sennit, on the left. 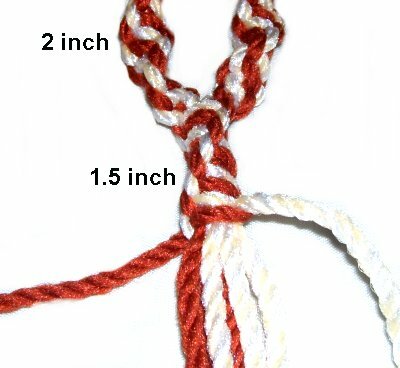 Fold the 12-inch cord 3 inches to the right of the knot, and secure it. 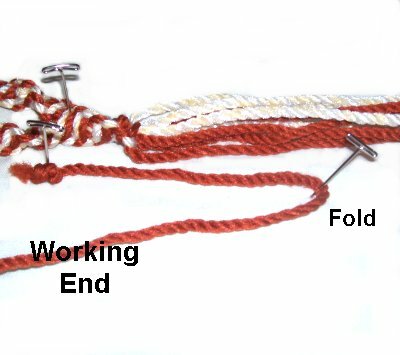 The long portion is the working end and will be used to tie the Wrapped Knot. 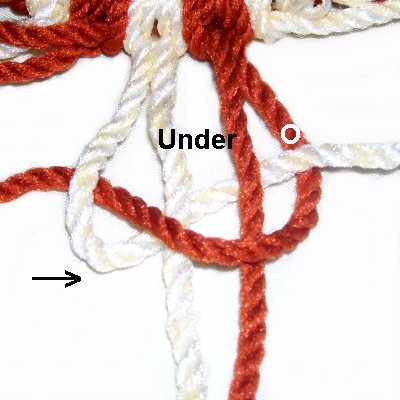 Step B: Wrap the working end around the entire group of cords, including the portion with the knot. 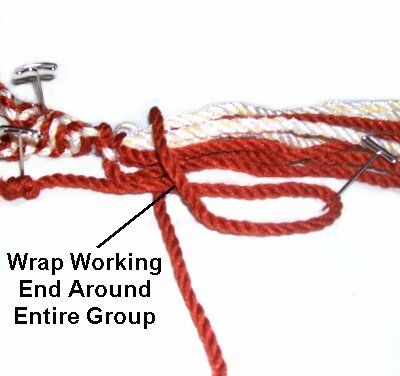 Wrap 5 times, moving towards the folded portion of the working cord. Make sure the coils are firmly wrapped, which makes tightening the knot much easier. 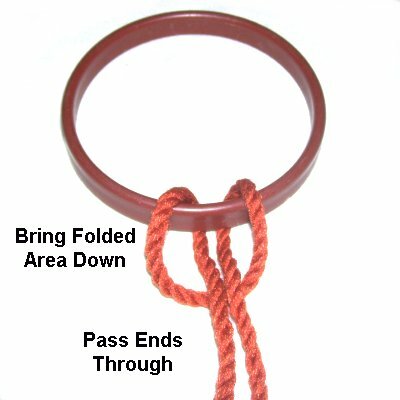 Step C: Pass the working end through the folded area (loop). Pull on the end with the knot, until the loop and other end goes inside the wrapped portion. That will tighten the entire knot. Step 7: Repeat step 6 with each set of cords, all the way around the Harvest Sun Wreath. Alternate the colors if you used more than one. Apply a light coat of glue to the outside of all the Wrapped Knots. When it's dry, cut off the portion with the Overhand knot, flush with the top of the wrapped area. Make sure you only cut the 12-inch cords, not the ones from the spirals. Step 8: Trim the remaining cords to 3 inches. 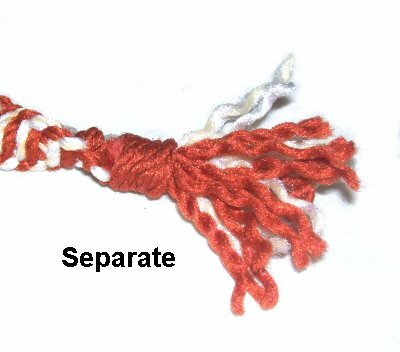 Separate the fibers from each cord, to form the fringe. Y can brush them if you wish, but they look good just the way they are. Step 9: Add the decorations to the ring using the fabric glue. 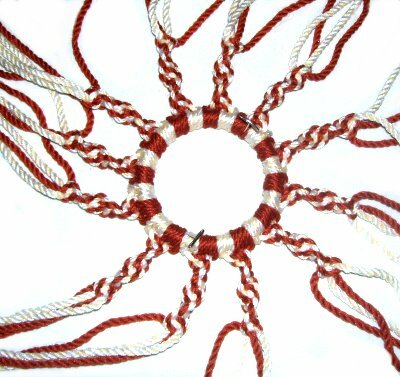 Fold a small piece of craft wire to make a loop, and attach it to the back of the Harvest Sun Wreath, to hang it on the wall. Have any comments about the Harvest Sun Wreath? Contact Me.